We are the Beauty Experts, awarded Guinot Crown 2014-2019 and recipients of this year’s Guinot National Therapist and most recent Regional Salon of the Year Awards. Beyond the little bay window lies a hidden haven. The ground floor provides everyday maintenance: manicures; pedicures; waxing; threading; electrolysis and a large skincare and Delilah makeup retail area. The six beautiful rooms upstairs are reserved for spa treatments, one of which, is a suite for two - perfect for friends or loved ones wanting to share the experience. Guinot products and machines provide the best in technology for results-driven, anti-ageing facials and slimming body treatments. Clarins exclusives offer relaxing and energising alternatives that will leave you feeling utterly heavenly. We want you to enjoy your time with us to the full, and suggest you arrive five minutes before your appointment to allow for a stress-free check in. We also recommend that you turn off your mobile phone to ensure your relaxation as well as that of others. Late night opening means we can always make time for you. Visit and follow our Facebook and Instagram pages for up-to-date offers and promotions, and follow our more frivolous side on Twitter. We offer Gift Vouchers redeemable against treatments or products, in full or part payment, which are valid for three months from date of purchase. We also reward your loyalty. 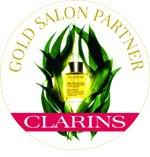 Collect points and refer your friends for money off treatments and redeem points for Clarins products with our Clarins For Me association.